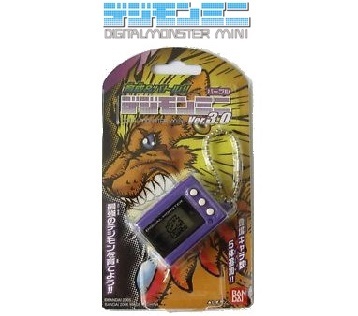 The Digimon Mini (デジモンミニ) is a Digimon virtual pet based on the older Digimon Virtual Pets. This is a Digimon 10th anniversary special. The Digimon Mini is modeled similarly to the original pets but at a much smaller size. The character set has been minimized and functions are limited. Digimon Mini Version 3.0 (デジモンミニVersion 3.0) is the third version of the Digimon Mini virtual pet. When you remove the tab from the Mini, you are greeted with the Bandai logo and are then asked to set the clock. In one minute, your Digitama will hatch, and you must feed it and train it as you do in past v-pets. Unlike past v-pets, the Mini does not use icons for its functions. Instead, the buttons select each function. Feed : Press the button and the icons for meat and vitamins will come up. Press A to scroll from meat to vitamin and press B to confirm. Poop/Sickness: Press A when your Digimon poops or get sick. Pressing A for poop will instantly flush the poop, and pressing A for sickness or injury will bring up the two icons for sickness and injury. Scroll with A and select with B. Lights (when Digimon sleeps): Press A and “On” and “Off” will appear. Scroll with A and select with B. Training: To train, hold the B button until “Ready” appears on the screen. Power up your Digimon by pressing B rapidly. Battle/Record: To battle, press B and you will be given two options, Battle and Record. Battle leads you into battle, and Record shows you the number of battles won and number of total battles as well as your Win Ratio. Scroll between the two options with A and select with B. Clock: Hold down C until the time appears. C also acts as cancel when you want to back out. Sound Off: Press and A and B at the same time and select on or off. Change Time: Hold down C to select the time and press A and B at the same time to change the clock. A Care Mistake occurs when the Digimon beeps for attention and you fail to respond within three minutes. It will beep when hungry, or when it falls asleep and wants its lights turned off. A Care Mistake can also be made by waking the Digimon with training or battle. Note that during the three minutes after it falls asleep, it won’t really wake up, and training/battle during this time is not a Care Mistake, unless you turned the lights off and on again. After a wake-up Care Mistake, the Digimon will fall asleep again after 9-10 minutes (and another Care Mistake will be counted if you don’t turn off the lights). Turning the lights off and on again, then leaving them on. Waking the Digimon by setting the clock to sometime during the day. Not giving any training or protein (unlike most other pets described on this site). Training is counted for evolution even if it was not successful. There’s no need to wear out your buttons! – A total of 30 or more battles. – A Win Ratio of 40% gives you a 20% chance of evolution. 60% or more gives you a 45% chance. 80% gives you a 80% chance.